Tandleman's Random and Particular Thoughts on Beer. Sarajevo had it bad during the last war. When they say "last war" in Bosnia, they don't mean World War 2, but the civil war which followed the break up of Yugoslavia. Sarajevo was besieged for 1425 days by the surrounding army of the breakaway Republika Srbska with over 10,000 killed. The scars, faded though they are, can still be seen there today. 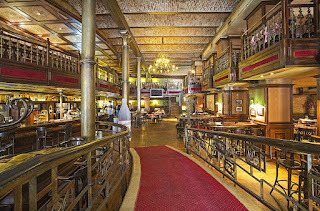 We had dinner in the Sarajevo Brewery Beer Hall one night. The brewery itself, also badly damaged in the siege is a big one dating back to 1864 and was the largest brewery in the Austro-Hungarian Empire, though extensively modernised in 1991. Sadly it was a victim of the war and it took until 2006 before it was restored in its mix of Ottoman and Austro-Hungarian styles. Frankly, looking at the outside and indeed in the Beer Hall, with its fin de siècle decor, you'd never know, though in fairness, we visited in the dark. The building is large and current production capacity according to their website is around 400,000 hectolitres. As far as I can tell, the brewery is still locally owned. Its beers are everywhere in Bosnia-Hertzegovina, or rather, Sarajevsko Beer, a standard continental pilsner type was everywhere. The only place I saw the dark was in the brewery. And trust me, I looked. The Beer Hall is superb. On the ground floor is a large bar and lots of wood and wrought iron with a large upstairs gallery where we ate and drank. there is a fine vaulted ceiling made of bricks and its dim lighting certainly made the place atmospheric. It was only opened in 2004, but to look at it and to experience it is to be transported back to grander times. I really don't know if some of it is old or restored, or if it is all "new". Either way, it looks tremendous and looking down on the bar from above is quite a delight. What of the beer though? I drank the dark beer which was really rather good, soft, sweetish and mild- like, but I didn't try the unfiltered lager, though maybe I should have. I looked in vain for the Oettinger Weissbier which is brewed in the brewery under license, but there was no sign of it there, or, indeed, anywhere else. The food was excellent and in the typical Bosnian way, substantial. You don't tend to need a bag of chips on the way home after dining out thereabouts. 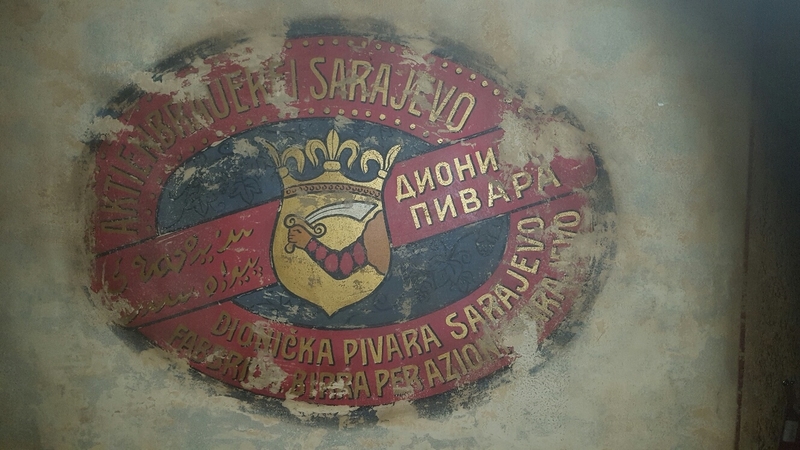 If you visit Sarajevo, don't miss it. 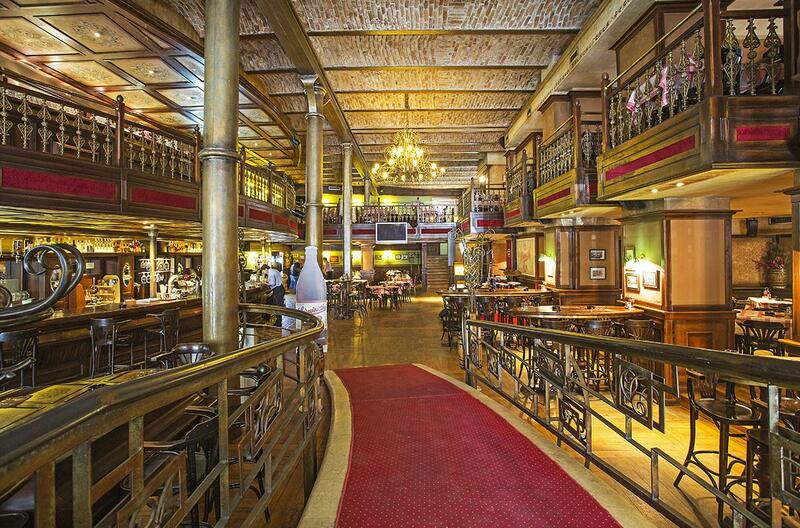 Looking back at the photos on the website, it has a kind of Wetherspoon look. But only in the photos. In real life that didn't occur to me. I'd have gone back again if we'd had time. Maybe I could have found the weissbier. After unrelenting taste-alike pilsner upon pilsner, that would have been nice. After my less that satisfactory drinking experience written about here, we sought some scenery. You can't go to Dubrovnik without sitting at a harbour-side in the sunshine, with houses tumbling down the hillside and the sun glinting off the water as the boats go in and out. People watching in such circumstances is not only a pleasure, but an absolute must. 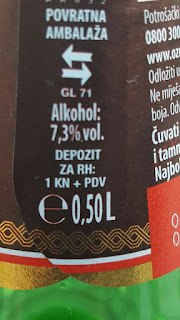 We found such a harbour and a little restaurant with tables outside and after a sneaky look at the menu I reckoned we could have a couple of drinks each and use up our meagre ration of Croatian kuna. 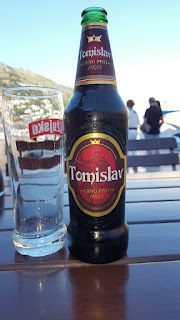 A glass of wine for E and for me, taking a punt, a bottle of a dark beer called Tomaslav. Now this at first appeared to be rather caramel like, but as I got stuck into the 500ml bottle, it became much more tasty and I started to really enjoy it. It made a refreshing change after many tastealike standard yellow lagers. Now we were up against it time-wise as we had to get back to meet the guide and our fellow travellers in the next half hour. I ordered one more and necked it fairly quickly, deciding, as you do, to take a photo of it for posterity. I was more than a bit taken aback to find it was 7.3% abv. Oops. As we set off to dinner, I did feel a bit of a buzz, but a couple of hours later, after a modest couple of (0.1) glasses of wine, I was more or less recovered. Bit of an amateur mistake that for an old soak like me. 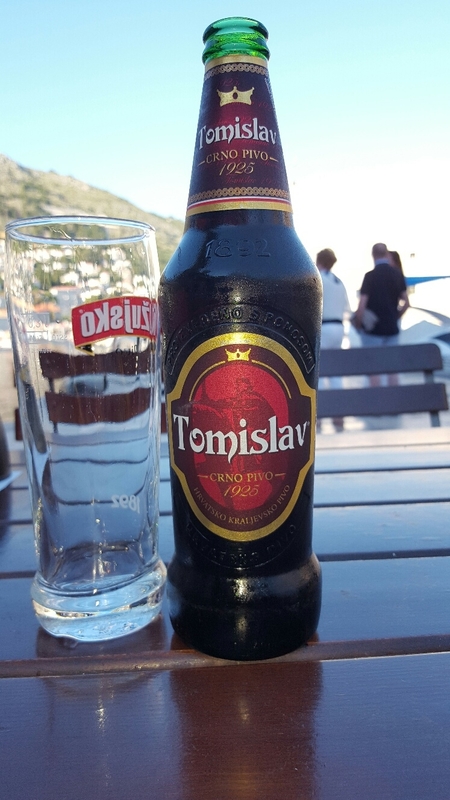 Seems in the Balkans, like the UK, any old glass will do. You rarely got the right glass, even if available. E thought my buzz was all in my mind, remarking "You felt fine until you knew how strong it was." Maybe. It isn't often - if ever - that I post a press release, more or less as intact, but this needs to be done. Those of us lucky enough to live in Manchester know what a great place it is to drink beer and now the we have the figures to prove how good it really is. Manchester has emerged as the cask beer capital of Britain, following a major new study into the beer sold in the city’s pubs and bars. The Manchester Beer Audit 2017 found 411 different cask ales on sale in venues throughout the Manchester City Council area, beating nearest rival Sheffield, which boasted 385 beers in its last survey, as well as Nottingham (334), York (281), Norwich (254), Derby (213), and Leeds (211). The survey also confirmed that Manchester is leading other cities in kegged “craft” beers too, with 234 different beers on sale throughout the city, an increase in variety that has been sparked by the recent boom in craft brewing. More than 80 independent breweries now operate across Greater Manchester and these breweries account for 38 per cent of all cask beers on sale and 36 per cent of craft keg beers. 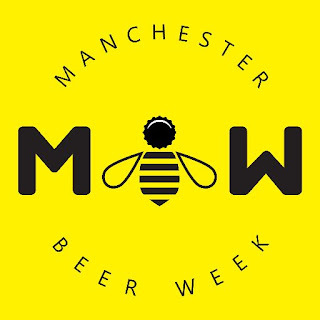 “The figures confirm what Mancunians already know – this is one of the best beer cities in Britain and possibly the best place in the world to enjoy great cask beer,” said Connor Murphy, organiser of Manchester Beer Week. It found 824 handpumps and 1,957 keg fonts on bars across the city, with 72 per cent of all pubs and bars selling cask ale. Well, we all knew it here, but it's great to have it confirmed. This was a splendid piece of real campaigning by CAMRA. I'm pleased to say that my Rochdale, Oldham and Bury Branch participated in such an important piece of work. 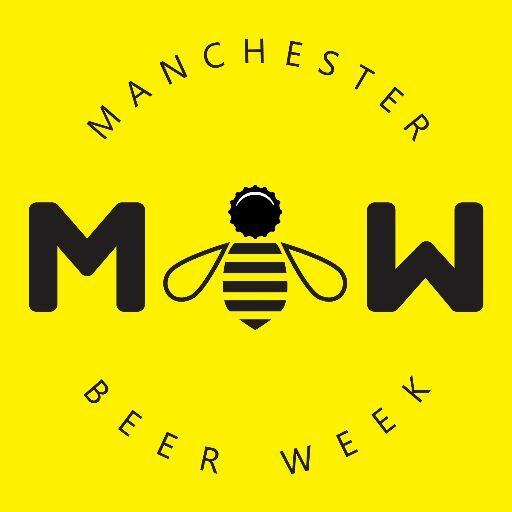 Manchester Beer week is in full swing. Connor Murphy, the Organiser is doing a great job of supporting and promoting this great beer city. He makes such an important point about the great quality of the cask beer here. Come and drink it with confidence. Bosnia was reassuringly cheap, but what about Dubrovnik? Dubrovnik, just over the Bosnia-Herzegovina border is one impressive place. Well preserved walls, glamorous with tremendous eye appeal, a number of picturesque harbours with red roofed villas, climbing up mountainsides, it has everything. It even has craft beer. And lots of tourists. We spent our last holiday night there and after a wander round the walls - well some of them - there are miles of the things - a beer was required. We had no Croatian money, but a quick visit to an exchange point and with €20 worth we thought we were good for a couple of drinks each. Dinner was going to be a credit card do. Foolish Tandleman. As we wandered we spotted a little bar with that most alluring of signs "Craft Beer". Razonoda looked fairly small, but well appointed and almost empty. Apart from us there were three others. It turns out to be part of the very posh Pucic Palace Hotel. Google is your friend. 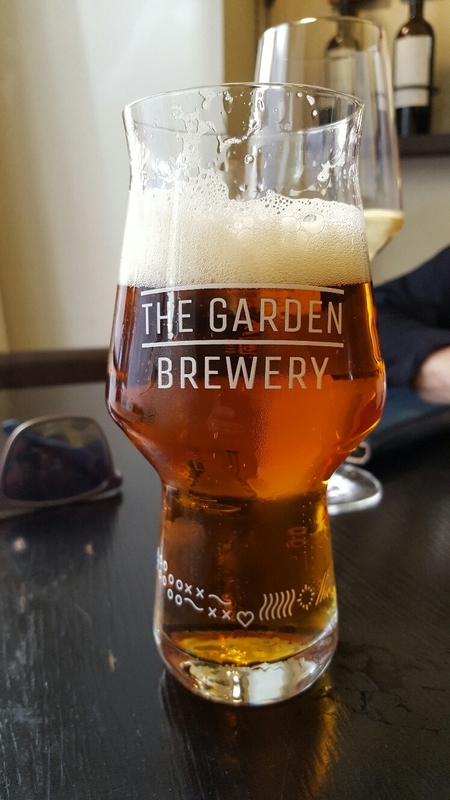 I chose a draft pale ale from Zagreb's Garden Brewery. A third of a litre and pretty good it was too. Sort of Sierra Nevada Pale Ale in style if you know what I mean. The wine list was comprehensive and meaningless if you, like us, don't know Croat wine. E chose one in the middle of the range. The measure was 0.1 of a litre, making what I first assumed to be a damp glass, a pretty expensive drink. At £6 a glass that's £60 a litre. I reckon Jeff Bell would admire that GP. My beer was an unknown quantity price wise. It wasn't on the menu. We lingered over our drinks and paid up. The waitress asked me if I'd like to pay by credit card. Looking at my paltry sum of Croat dosh and the tab, I agreed with her suggestion. Converted it was a tad under £12. Our subsequent meal was pretty dear too, but in our rather nice hotel, drinks were under half the price and the wine was in little 200ml bottles. The beer was reasonable too. Sadly there was no craft, outrageously priced or otherwise. At least my £10+ a pint beer wasn't murky and I did enjoy it. Craft eh? You have to admire the chutzpah. On Saturday I fancied watching the football. OK I dreaded watching the football as it was Scotland v England, but I still wanted to see it. I like the suffering you see. Of course we could have watched it at our flat, but I like to watch such things in the pub. Among people. I had also just come back from my holidays abroad and after generic 5% lager, I fancied a pint or two of real ale. As you do. In two different pubs - we switched pubs at half time - the beer was poor. Usual problems of it being warm and flat and in the first, nobody that I saw at least, was drinking it, while in the other, it was just not kept well enough. So far, so normal. I was after all in London where it is foolish to believe that hope will overcome experience, especially in summer. Next day we walked along Wapping High Street and we had a drink in Sam Smith's Captain Kidd. E likes it there, but then she has a higher tolerance of the Wapping set than I do. I had Sam's Wheat Beer - I wasn't chancing the cask - and E a half of Pure Brewed Lager. I believe it was the best part of seven quid the pair in this "cheap" Sam's outlet. We left after one and continued our walk and as we neared the flat, debated another drink in a pub. We decided on balance not to and nipped in to Sainsbury's to buy a Sunday Times. Being lushes, we also bought a cheapo bottle of wine for just under £7.50 for both wine and newspaper. Back at the flat we read the paper and supped the wine. It kept us going for over three hours for around 70p more than our OK-but -nothing- special beer in the Captain Kidd. And the wine, (on offer of course) was just fine as a background accompaniment to the Sunday paper. No wonder people sup at home. No wonder pubs are empty. And some galoots will tell you we aren't paying enough for beer! I'm not picking on Sam's here. It would have been seven notes almost everywhere in E1. The football wasn't that bad either as it turned out.comparatively speaking. A bit of a CV. Tandleman is a veteran beer lover, local CAMRA Chairman and activist, beer writer, beer reviewer and pursuer of all things good in beer. He lives in the North West of England and London. Despite his CAMRA membership, he does not limit himself to cask conditioned beer, though he believes that cask conditioning, when done correctly and appropriately, brings a quality to beer that is hard to equal by any other kind of presentation. He is a strong supporter of Northern methods of beer dispense and avidly detests poorly presented beer and dislikes pasteurisation. He regularly visits Germany, has conducted corporate British and German beer tastings for CAMRA at the Great British Beer Festival where he has worked for years on Biere Sans Frontieres and was Deputy Organiser at CAMRA's very successful National Winter Ales Festival in 2009, 2010, 2011 and 2012 and at the Manchester Beer and Cider Festival from 2013 to date. He admires good brewers wherever they are and has travelled extensively in pursuit of good beer to drink. This blog mentions specifics; pubs and beer, good and bad. The opinions will be forthright, but you can always disagree, just don't be offended. Comments from those mentioned are particularly welcome and a right of reply is hereby offered. Ultimate London Pub Crawl | Two friends on a 23-year pub crawl around London's 270 tube stations. Read my information and links and then decide for yourself. You don't have to be Sherlock Holmes. These are the life blood of any blog. Please feel free to comment. I do not practice censorship if you stick to the point, but personal insults are frowned upon and may result in deletion. Anonymous entries may have the piss taken out of them or be deleted. Beer samples are welcome, but I cannot guarantee a good review. You, the brewer, on the other hand can. 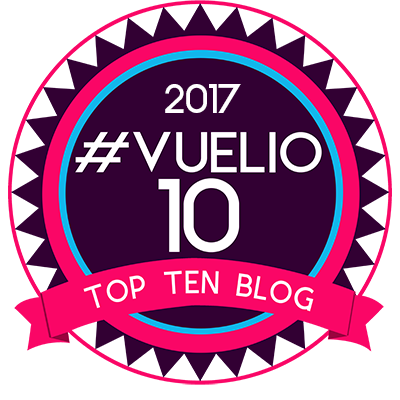 The contents of this blog represent the personal views of the author only. They do not represent CAMRA policy in any way whatsoever. The contents of this site and individual articles may not be reproduced in whole without the express permission of the author and will require an appropriate credit. Extracts may be reproduced with a credit to the author.